The 1964 Council of the Bishops of the Russian Church Abroad (ROCOR) marked a new milestone in its history: on May 27, 1964 Metropolitan Anastasii (Gribanovskii) retired. Bishop Anastasii’s episcopal consecration took place in Moscow in 1906. In 1913 he was appointed to devise rites for the glorification of St. Patriarch Germogen, which was presided by Patriarch Gregory IV of Antioch. In 1915, Anastasii was appointed Bishop of Chisinau and Khotin. He designed the rite of installation of St. Tikhon as Patriarch of Moscow on November 21, 1917. On December 7, 1917, the local council of the Russian Church elected him a member of the Synod of Bishops. In 1918, after the accession of Bessarabia to Romania, Archbishop Anastasii refused to subordinate to the Romanian Church and was sent out of country by the Romanian military authorities. In 1920 he was appointed by the Supreme Church Administration of the South-East of Russia to Constantinople, which was occupied by the French and British troops, to address ecclesiastical needs of Russian refugees. Evacuated from the Crimea in November 1920, the Russian Army created their own worldwide network – the Russian All-Military Union – in order to continue the struggle against Bolshevism. The Russian Church Abroad became the Church of this emigration that was traumatized by the civil war. The flock of the Russian Orthodox Church was very anti-communist: one could not expect from them a politically correct attitude toward the Bolsheviks. In 1924, the Ecumenical Patriarchate required Archbishop Anastasii to stop commemorating Patriarch Tikhon in the Divine Liturgy and to abstain from any political rhetoric. Archbishop Anastasii did not fulfill this demand and was suspended. After his departure from Constantinople in 1924, Archbishop Anastasii was appointed to Jerusalem as an administrator for the Russian Ecclesiastical Mission. There he continued his encounter with Greek Orthodoxy, and he also visited Damascus. In 1927, at the request of Patriarch Damian of Jerusalem, he took part in the consecration of new bishops for the Jerusalem Patriarchate. At that time Palestine was under British mandate. Archbishop Anastasii maintained intensive contacts with the British and took part in joint prayers with the Anglicans. As a result of his labors, the Gethsemane monastic community was founded by former Anglican nuns who had become Orthodox. 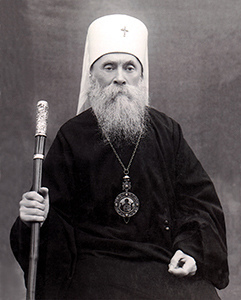 In 1936, after the death of Metropolitan Antonii (Khrapovitskii), Anastasii became the second Primate of the Russian Church Abroad. During World War II, he did not escape the illusions prevailing among the flock of the Russian Church Abroad that the Germans, having liberated Russia from Bolshevism, would permit the establishment of an independent Russian state. Metropolitan Anastasii supported Russian Liberation Army of General Andrei Vlasov. Nevertheless, Metropolitan Anastasii’s intuition and caution saved him from calling to the entire flock of the ROCOR to support Drang nach Osten (that is, German expansion into Slavic lands). In 1950, Metropolitan Anastasii moved to the United States. Here he maintained warm relations with the Greek Archbishop Michael (Konstantinides), whom he had met in Constantinople. In the postwar period, Metropolitan Anastasii had a rigid attitude toward the Moscow Patriarchate. At the ROCOR Council of Bishops in 1959, the decision was made to accept clergymen of the Moscow Patriarchate through repentance. In his so-called last testament, Metropolitan Anastasii called on the faithful to have no public contacts with representatives of the Moscow Patriarchate. Today, those who did not recognize the 2007 reconciliation of the Moscow Patriarchate and the Russian Orthodox Church Abroad refer to this document, pulling the words out of historical context. In exile, Archbishop Anastasii showed a rare ability to step back from the noise of the dominant trends. At the Pan-Diaspora Council of 1921, he was against the adoption by the council of an appeal for the restoration of the Romanov dynasty, supported by Metropolitan Antonii. He was acutely aware that St. Patriarch Tikhon had a very different experience of life than those Russian bishops who left the country. At the Council of Bishops in 1953, Metropolitan Anastasii spoke out against the glorification of St. John of Kronstadt, believing that it was not the business of the refugee Church to glorify the All-Russian miracle worker. Metropolitan Anastasii was against Russian intervention in the internal affairs of the Greek Orthodox Church, and a Bishop’s Council passed a resolution not to participate in the consecration of the Greek Old Calendarists. This resolution was breached in 1962 by Archbishop Leontii of Chile and Peru. It became very difficult for Metropolitan Anastasii to head the bishops’ “conclave” of the Russian Church Abroad due to his advanced age, and he summoned a Council of Bishops with the purpose of electing a successor. On May 27, 1964 Metropolitan Anastasii confirmed that he had not changed his mind about retirement. Since Byzantine times, conciliarity was maintained in the Orthodox Church by the confrontation between the “diplomats” and “zealots.” At the time of the Council of Bishops in 1964 there was a sharp confrontation between these two episcopal parties. The leader of “zealots” was St. John (Maximovitch) of Shanghai and San Francisco, and the leader of the “diplomats” was Archbishop Nikon (Rklitskii) of Washington and Florida. The election of a First Hierarch from either of these two factions would have made it extremely difficult for the other party to work with this person. To resolve this crisis, St. John offered to withdraw his candidacy, if Archbishop Nikon would follow suit. The result was that Bishop Philaret (Voznesenskii) became the Primate of the Russian Church Abroad. This opened a new period in ROCOR history. Bishop Philaret had been consecrated only a year earlier, and represented a new generation of leaders. On November 1 at the Synodal Cathedral in New York and later in Utica, New York, the glorification of St. John of Kronstadt took place. The Russian Church Abroad was turning into a self-sufficient entity. On May 22, 1965, Metropolitan Anastasii died and was buried in Holy Trinity Monastery, Jordanville, NY. Deacon Andrei Psarev teaches church history at Holy Trinity Russian Orthodox Seminary in Jordanville, NY. He also serves on the SOCHA advisory board and runs the ROCOR Studies website (www.rocorstudies.org).